​Almost 30,000 copies in circulation. Contact us for your own personal copy! 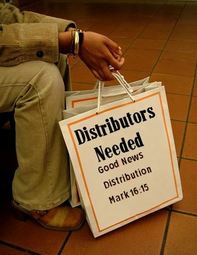 Established in 2012 as a way to supply the Truth of the Gospel of Jesus Christ Good News Distribution began setting up boxes in truck stops, gas stations, chapels, and travel centers across the mid-west. In these boxes we are able to distribute Bibles, CD's, Christian books, Tracks, Devotionals, Truck Stop Chapel Guides and more. Our long term goal is to distribute these resources but also to equip truck drivers, truck stop employees, churches & chapels to assist in the distribution and supply of the resources for the traveling public. We love network with like minded ministries, to spread Gods word. ​In our 7 years of ministry, we have partnered with many other great ministries. Sharing the Need For Distributing God's Word! Click on the photo below to hear more about distribution opportunities.